Dr. Shreelina Ghosh perfected the ancient art of Odissi dance under the strict supervision and loving care of the eminent Odissi exponent, Guru Aloka Kanungo for more than 30 years. She was initiated into the art by Guru Giridhari Nayak at the age of 4. She has also been trained by Guru Ratikant Mahapatra, Guru Sujata Mahapatra, Guru Jhelum Paranjape, and Smt. Kavita Dwibedi. Shreelina has performed in most major festivals in India, including Khajuraho Dance Festival, Puri Beach Festival, India Habitat Center, Uday Shankar Dance Festival, Surya Festival, Kerala; Thalam, Kerala; Swaralaya Nrityotsav, Kerala; Kolkata Dooradarshan Utsav. She performed a number of times on the Indian National Television (Dooradarshan) and on state channels. In USA, she performed in Arizona, Texas, South Dakota, Washington, Illinois and in several cities in Michigan. 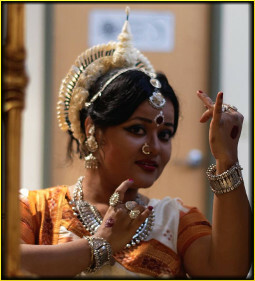 She was invited to perform for Ragamala (Seattle) and in the Lincoln Center of Performing Artrs (NY). She has collaborated with several artists in creative productions in Arizona, Michigan, and South Dakota. 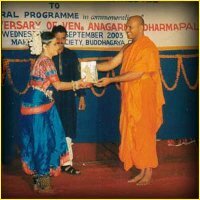 Among other accolades for performance, she received "Star of Tomorrow Award" from West Bengal Dance Group Federation, honorable mention at the Excellence in Diversity Awards at Michigan State University for "Artistic Expressions", and felicitation from the Thero at Mahabodi Society of India, Bodh Gaya. Shreelina has learned the nuances of Odissi Classical Music from the eminent Guru Gopal Chandra Panda and is a first-class Visharad in both Odissi dance and Rabindra Sangeet. She earned her PhD in Rhetoric and Writing from Michigan State University and is currently employed as Assistant Professor of Professional and Technical Communication at Dakota State University.